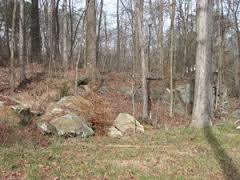 The McGarity-Etheridge site is a 26-square-mile area of soapstone outcroppings, known to archaeologists as Soapstone Ridge, in Atlanta, Georgia. The site, which dates to the Late Archaic Period between 3000 B.C. and 1000 B.C., was protected as a developer agreed to sell the site to the Conservancy. One of the most significant developments for sedentary prehistoric populations was the invention of soapstone vessels for cooking. For hundreds of years, soapstone vessels were highly desirable as cookware for Southeastern peoples, and it is hypothesized wide trade networks along the Atlantic Coast to Louisiana existed to disperse the heavy vessels. Evidence of ancient soapstone-vessel manufacturing is still visible today at the McGarity-Etheridge site. Numerous unfinished pre-forms still cling to the boulders; examples of workshops and all phases of quarrying exist at the site. “The soapstone quarrying activities of these Late Archaic peoples might be viewed figuratively as Atlanta’s earliest industry,” Says John Worth of Atlanta’s Fernbank Museum of Natural History. This archaeological jewel was listed on the National Register of Historic Places in 1973, but was nearly lost in 1996 when property owners began development of a new subdivision. When the owners learned of the site, they sought a way to preserve it, ultimately selling six acres to the Conservancy.